So as I've told you before, we are renting this house. And it's a great house. I have no complaints other than the fact that I can't paint the walls. (I even got up the nerve to ask the landlords when they agreed to let me paint the fireplace... no go. Fireplace - yes. Walls - no. Sigh.) Oh, and the fact that there are no doors on the closets. Closets are for hiding clutter...are ya with me on that one? But I digress. Back to painting walls. 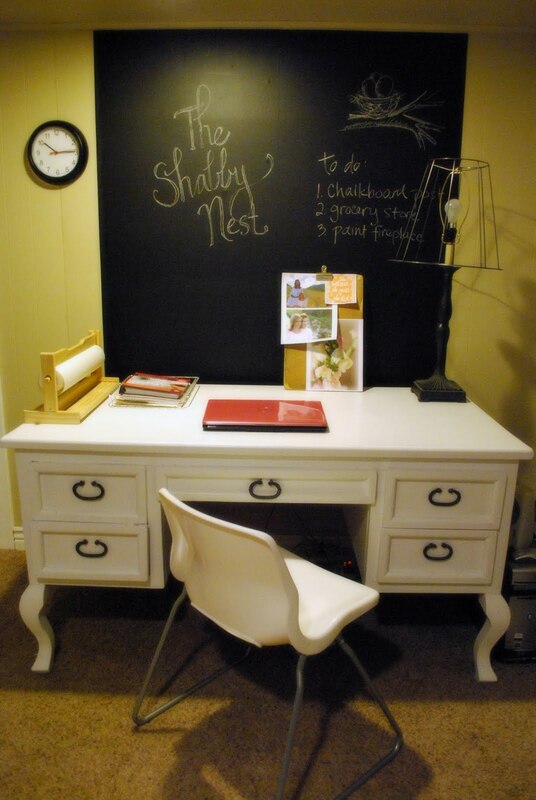 I have been wanting a chalkboard wall in my office/mom cave ever since I saw Emily's office. Swoon! And I have been toying with ideas of different ways to have the look of an entire chalkboard wall without painting the wall itself. I didn't want it to be just a big chalkboard...I wanted it to be a wall. I came up with some ideas that I thought were pretty good, but I was never convinced...until I saw this post at Craftberry Bush. I looked all over trying to find the long rolls that she talks about in her post, and was finally able to locate them at Michael's Craft. So I bought 4 rolls...they're each approximately 20" across and 60" long. They don't reach from the ceiling to the floor, but since the desk was going to be sitting in front of them I figured there would be the illusion that they reached the floor. I was literally able to put them up in about 10 minutes. And they stick GREAT! AND...the most important part for renters...they remove just as easily. I am seriously just about giddy. So much so, in fact, that I didn't even style the photos...I just took 'em to show you the wall. So, just so we're all on the same page, I still need to accessorize the desk. But isn't that chalkboard fabulous??!!?? I'm going to say it again...ADHESIVE VINYL CHALKBOARD BABY!! That's brilliant. I found some at Dollarama, $1 for a sheet that's about 2ft by 3! I'm die cutting it, see what happens!! oh my goodness. I am off to find some! 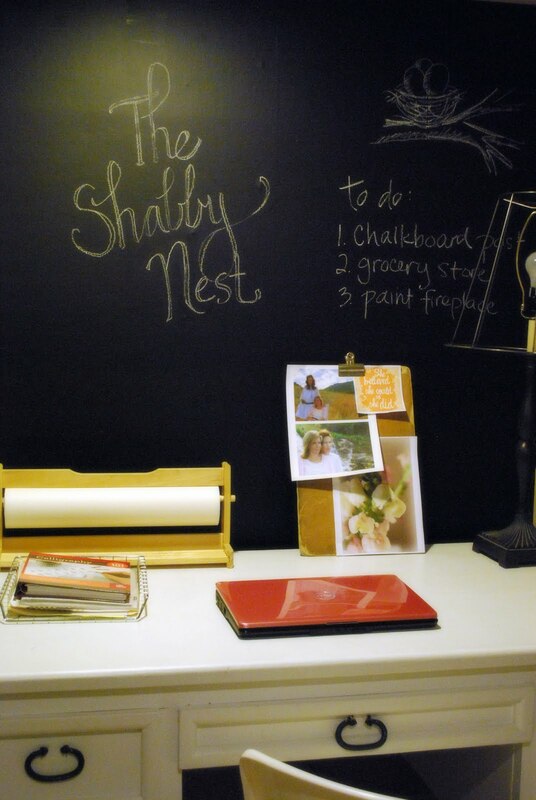 I keep hearing about chalkboard adhesive and really want to find a place to use some of it, it's so cool! Looks awesome in front of your desk. Ooooohhhhh I am off to Michael's!! We are renters too but our landlord said we can paint, but the less I have to REpaint the better!! I love this! Awesome look! Total problem solver!! EKK...I'm giddy with excitement!!! Thanks SOOOO much for showing me this! We'll be renting for a while too and I've always had to dismiss having a door/wall/cupboard turned chalkboard. yep! i found some awesome stuff at Dollarama in Alberta while visiting my family! $1 later I have a roll of it;) yeah-a;) love it!! what fun...a perfect idea for my school room...thanks! What a great idea. It looks fabulous. I'll thank you now. Thank you! What a great solution for us renters. Oh my Goodness! How awesome is that??!! LOVE IT!! Thank you so much for sharing this! 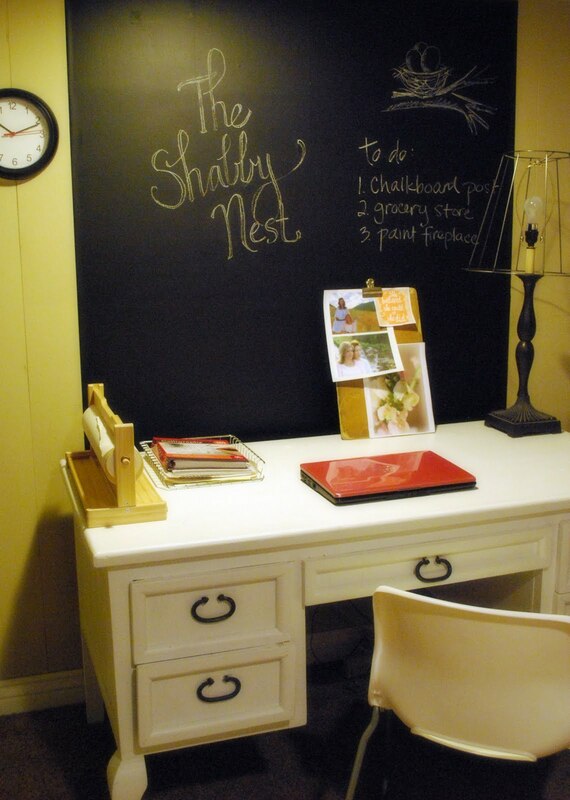 I've been looking for a way to add a chalkboard wall in my home classroom! This is brilliant! That is some slick stuff..I have never heard of this before..Clever..Looks very nice and easily removeable.. I love it, and I CAN paint my walls but I'm lazy, and I have a great little wall behind a massive desk just crying out for this. So can I be the crass friend and wonder what chalkboard vinyl sets ya' back? Love it, great idea for all of us who may not want it to be permanent! Love it! I say the rolls at Micheal too, actually had them in my cart - then I put them back because I didn't know what I would do with them. Now I'm think I need to get myself back to Micheals first thing tomorrow morning and pick some up! Such a great option for home-renters! As a fellow renter, I'm definitely going to check out this option ASAP. Thanks for the insight! And I became a fan on facebook, still trying to get to the blog!!! What a fabulous idea! I'm also renting a great house that's lacking some things... like a bathroom door. I love this Idea. My son asked for black walls (no WAY) this is a great compromise. thanks for sharing and giving me the idea. Now if I could talk him out of having a motorcycle painted on his wall???? ?